Ralph of Diceto (d. 1202) gained an education in Paris, and became a dean of St. Paul's Cathedral in 1180. He wrote a variety of historical works. 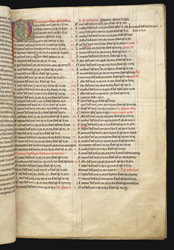 This page contains a list of the popes, starting with St. Peter, whose name is marked with a large coloured initial 'P'. Each entry records the length of their papacy in years ('annis'), months ('m'), and days ('d'): Peter, for example, was Pope for 25 years, one month, and 7 days: 'annis xxv, m. i, d. vii'. The last name in the list, a few pages further on, is Celestine III, who became pope in 1191 and died in 1198: the list was therefore presumably drawn up between those dates.